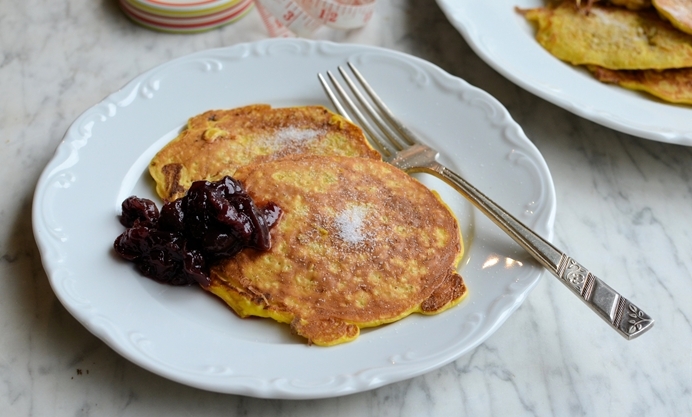 These delectable gluten-free pancakes are a great alternative to wheat pancakes. They are low-calorie (perfect for those who are trying to watch their weight), but are also tasty, fluffy and very filling. Pancake Day (Shrove Tuesday) is fast approaching and in readiness for the big day, as it’s always a big day in our household, I’m testing out some pancake recipes! But, it’s also a time of the year when we are all cutting back on calories, in wake of New Year's resolutions. So what is needed is a “skinny pancake” recipe that tastes great and fulfils the towering stack of pancakes that my family will expect on Pancake Day. I have made low calorie pancakes before, for the 5:2 diet, and my recipe for Blueberry & Oat Pancakes with Cinnamon is always popular, as are my non-diet recipes for Fluffy Porridge Pancakes with honey and “Staffordshire Oatcakes” - Traditional English Hotcakes/Pancakes; however, I decided to create a recipe this time that is not only low in calories, but is also gluten-free (so more people can enjoy a pile of fluffy pancakes this year), as well as being tasty and filling too. 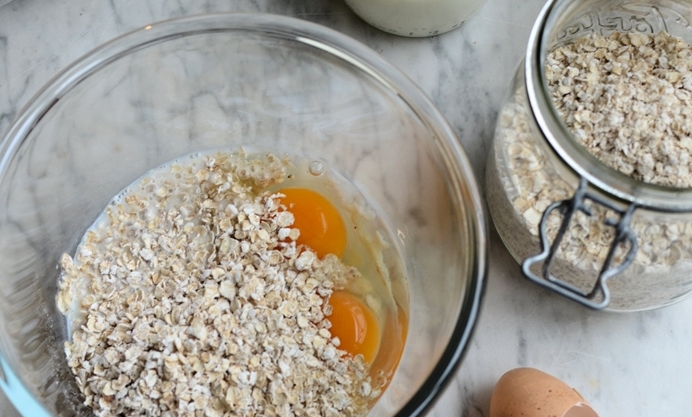 Following on from my experimental pancakes made with the leftover porridge, I made a fresh batch the next day, the recipe for which is shared below. 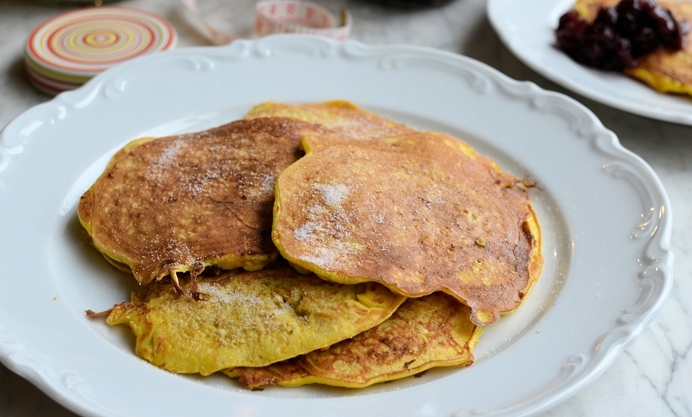 These Skinny Porridge Pancakes are easy to make and taste surprisingly like normal wheat pancakes. They fry like a dream in low-fat oil spray and are extremely filling, perfect before a long trek to work. I served them with a low-sugar, high-fruit, cherry compote, but my husband wants them with lemon and sugar next time, and I agree that they will be wonderful served this classic way. The recipe makes between 8 and 10 pancakes, and the total recipe calorie count is only 435 calories, making each pancake a low 43 calories for a 10 pancake batch. 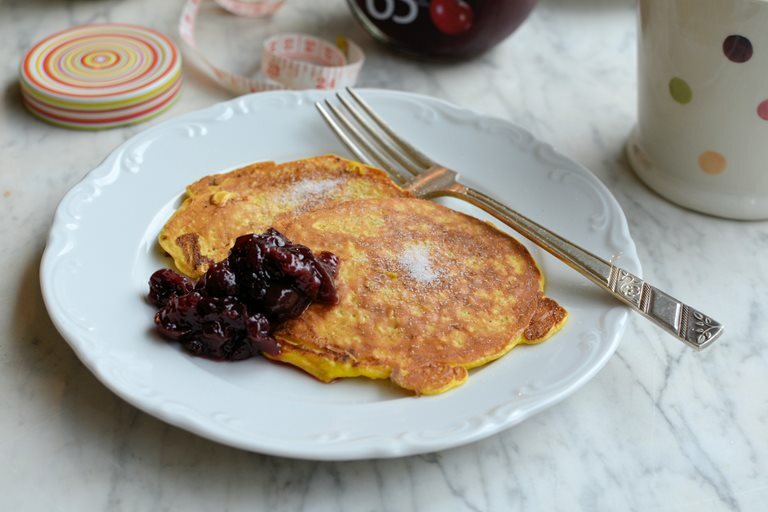 Check your fruit compote, but mine was only 43 calories per tablespoon and when served with lemon juice and low-calorie sugar sweetener there will be no calories added to your pancake stack! You can make the batter ahead of time, it’s almost better that way as the oats swell and make a thicker and fluffier pancake. I hope you enjoy these as much as we did, and don’t forget you can omit the sugar for savoury pancakes too! Serve with low-sugar compote or lemon with sweetener.